After Teenage Mutant Ninja Turtles was pulled from Virtual Console, two more titles are set to leave the service in Europe this month. 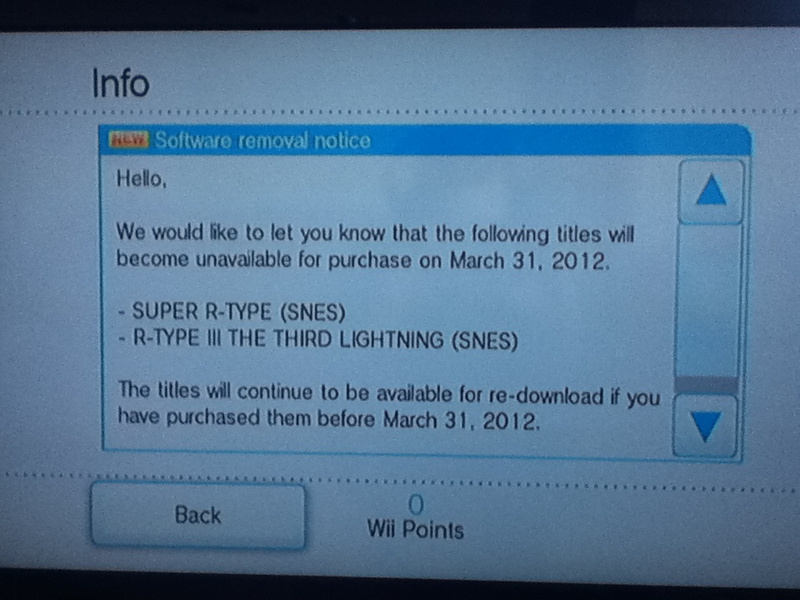 Super NES games R-Type III: The Third Lightning and Super R-Type will no longer be available to download after 31st March. It's not the first time this has happened with the venerable shooter series: in September 2011 R-Type for Master System disappeared from the service. Anyone who's already bought the Super NES games will still be able to redownload them after 31st March, but anyone who's yet to shell out for some 16-bit shooting should act fast. This is my biggest problem with digital downloads. My only guess is because of the Turbographx-16 version of R-Type. Not "that" interested in these games...but may buy in case i want to play in the future sometime...Warnings for stuff like this is great! Maybe this is the reason why they are releasing more games into the Virtual Consoles now? So that it balances out this content that is going away. What is this company G-mode? What could be happening that would make all their games be removed from the service? To be honest, there has yet to be a game removed from the VC service that I had the least bit of interest in. Actually other than TMNT all of the games removed were ones I had never heard of. @MachineLaw I highly doubt that would have anything to do with it. Japan's VC releases are coming at pretty much the same pace they always have. The EU bulk release is just NoE generously playing catch-up. I already knew about this, someone created a forum a few weeks ago. I don't really care about wii vc, just the 3ds one, so as long as the 3ds vc isn't losing games, I'm happy! R-Type is great fun. But I'll probably take a chance and buy a version of it IF they do one for the 3ds shop. Don't really see the point of pulling these games though. You can still redownload them? No problems here, I guess...except now new customers won't be able to play these beasts of games. I downloaded both last night. R-Type III is a real good game. Get it now if you can. 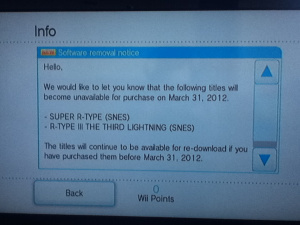 Will it be taken off of NAs Wii Shop Channel or did they not come to NA? @Tsuchinoko The company for these games are Irem and they've been having financial troubles for awhile. @SkywardLink98 They came out here and it's likely they'll be removed here as well. so nintendo keeps stating that the VC isn't dead, yet instead of adding new games, they're removing games. Makes sense.... no, no it doesn't. Sadly, I wouldn't bee too surprised if the TG-16 R-Type was also removed from the VC. I still remembered the weapon select code for Super R-Type back in the day by heart: Down, R, Right, Down, Right, Right, Down, Right, Down, Down; R, Right, Down, Y, Down, Right, Down, Left, Right, Down, Right, Right. I think I'll download this... now. Big thanks for the heads up, guys ! Wasn't sure which ones i had and it turned out i hadn't downloaded Super R-Type yet.Good to know that now i've got all R-Type goodness that was available on the VC. As a certain character from Allo Allo would say: Bad nose!! But seriously: It's really bad! !